Starting an AMT 1955 Chevrolet Bel Air Sedan kit, Steven opened the doors and trunk lid, He also radiused the rear wheel openings to fit the large rear tire from a re-issue of the Dodge Ramcharger kit. Steven source the Chrome reverse wheel from an early AMT 1957 Chevy for the rear and his parts box for the front. Front tires are Revell two-piec units from his parts box. 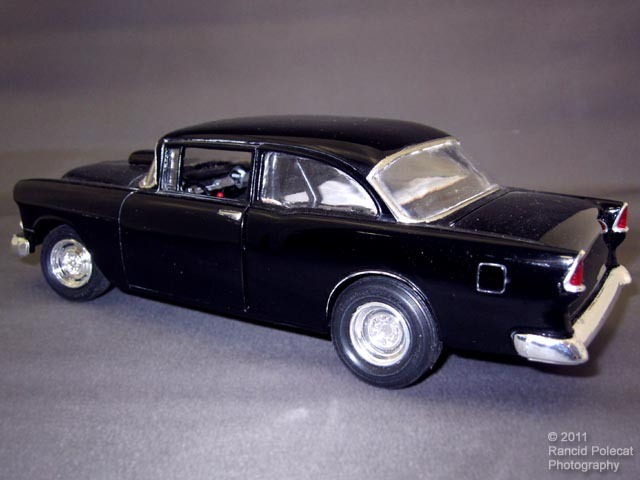 The body is coated in Tamiya black that's been shined up with Meguiar's polishes.